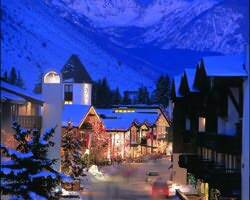 Tours de Sport's Blog: Luxury Spring Savings: Lodge at Vail, Vail Colorado. Luxury Spring Savings: Lodge at Vail, Vail Colorado. The days are getting longer, the snow is staying deeper and now the savings are getting bigger. Renowned for relaxed luxury and impeccable personal service, The Lodge at Vail, a AAA Four-Diamond Award-winning hotel, combines the elegance and charm of an alpine inn with the warmth of western hospitality. Visit a place of award-winning restaurants and premier accommodations where the staff greets you by name and anticipates every need. This intimate alpine resort prides itself on a location unlike any other, even in Vail. Resort amenities include Wireless Internet access in all guest rooms, Rockresorts Spa, fitness center,outdoor heated pool, four hot tubs,sauna two restaurants and Mickey's piano bar. Come out and enjoy some GREAT spring skiing in Vail and get a head start on your summer tan.